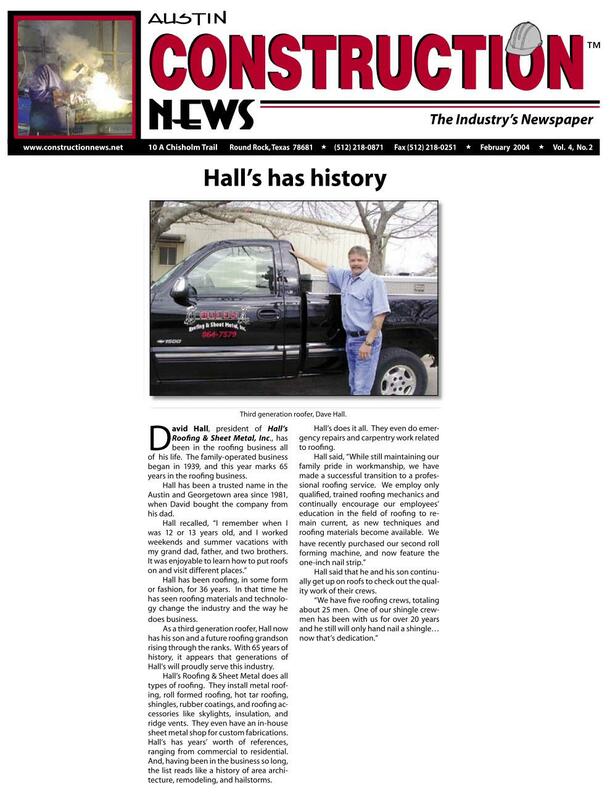 Home | Hall's Roofing and Sheet Metal Inc.
All of us at Hall's Roofing and Sheet Metal strive to keep up on the latest advancements in the field. We look for the most efficient means of delivering the best roofing systems to our clients. We have been a trusted name in the Austin and Georgetown area since 1981 and a family owned business since 1939. We remain committed to providing high-quality services. For your protection, we are licensed, bonded and insured. Whether your needs be as simple as a minor repair or more complex in nature, Hall's Roofing and Sheet Metal can provide the solution. We satisfy the unique needs of each of our clients. All work is performed by experienced full-time crews with close supervision. We offer references upon request. Call or "Email Us"today for additional information. Insurance claims are accepted. Please fill out our "Free Estimate Form" and be sure to mention you saw us online.